12 Creme Colours for all kinds of character work including aging, illness & weathering. All the colours have been formulated using earth pigments for the most realistic look when applied to the skin. 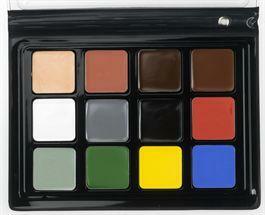 As with all Makeup International products, this range of shades has been photographically tested for the screen. The character palette is also excellent for all theatre work. For an array of effects including bruising, capillaries, veins and tattoos.